In November, Kidrobot released series 2 of The Mechtorians. The figures turned out beautiful and really show the Mechtorian spirit, but it was quite an adventure for Doktor A to get to this point. Thankfully it all worked out and Doktor A is ready to release his AP sets this Monday. Every set contains each of the 14 characters. They are individually signed and numbered and are housed in a point-of-sale display box like you would find in a store. But that’s not all! The AP set also comes with a really cool mini print featuring line work of all the figures in the series. They look so good! I’m always amazed when artists can portray a character with just a few lines and they’re still recognizable. 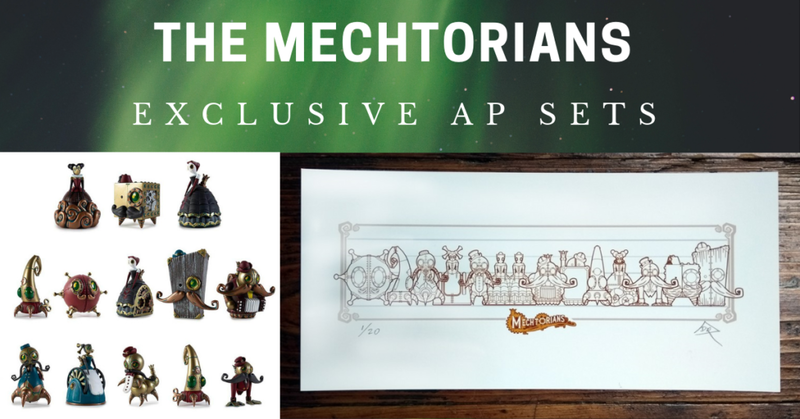 The print is an AP exclusive so you won’t find it anywhere else. The sets will go on sale December 3rd at 6pm UK time in Doktor A’s online store. Each set is £250 ($319) which includes worldwide tracked shipping. With 20 sets available, you have a decent chance of getting one. But don’t wait around too long! You can find Doktor A on Facebook, Instagram,Twitter and Patreon.